At her retirement home in Wedding Tree, Louisiana, ninety-one-year-old Amelie O’Connor is in the habit of leaving her door open for friends. One day she receives an unexpected visitor—Kat Morgan, the ex-fiancée of her late husband, Jack. Kat and Jack were high school sweethearts who planned to marry when Jack returned from France after World War II. But in a cruel twist of fate, their plans were irrevocably derailed when a desperate French girl overheard an American GI’s confession in a Parisian church. . .
Now, Kat wants to know the truth behind a story that’s haunted her whole life. Finding out how Amelie stole Jack’s heart will—she thinks—finally bring her peace. As Amelie recalls the dark days of the Nazi occupation of Paris, The French War Bride reveals how history shapes the courses of our lives. . .for better or for worse. 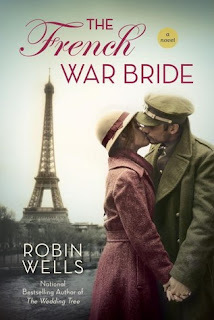 The French War Bride was a great surprise read for me as I’ve never read a book by Robin Wells and I was a bit concerned that it was part of a series and that I would have missed something having not read part one. It would appear though that the plot is entirely independent. I was immediately drawn into the story with Kat visiting Amelie in her retirement home in present day Louisiana. Amelie is a bit snarky and edgy and Kat is equally antagonistic and the fact that they were both in their 90’s gave me a great thrill at their spirit. Kat is intent on getting to the bottom of their shared history, their shared romantic attachment to Jack and how he ended up with Amelie. Despite their nit-picking at each other you could tell that the love they had for the same man was true. Amelie is persuaded to tell her half of the story because she feels that Kat will rest more easily with the truth but she’s certainly not willing to allow Kat to believe that she was entirely to blame for the breaking of Jack’s promise to Kat before he left to serve in France. Amelie story is filled with tragic losses and unthinkable circumstances during France’s occupation but she’s not innocent, she knows there are things she should not have done. I liked her spirit though and her feelings for Jack were tender and true. Jack’s sense of honour, of doing the right thing, made both women’s lives difficult. I wish he’d been there to tell his side of the story at times. I did end up feeling a bit sorry for Kat, she was left without an explanation and though she was demanding and difficult it was not her fault that she was abandoned in such a way. Their stories intertwine and as Amelie recounts her part to Kat you can see how it happened- but in the end I’m not sure I would have been entirely satisfied if I was Kat?